Tonight on The Midnight Tracker, we’re going to keep this simple. With the beginning of classes looming for our high school sophomore, it has been a hectic time around the house. I could use a blast of something less complicated. That something presented itself last night, when I put on “Patches,” the 1970 album from Alabama soul singer Clarence Carter. Of course, I dig the single of the same name, which was a big hit that year, the first year I really started listening to the radio. My first thought was to serve up the side with “Patches,” but as I listened to the whole thing, the other side turned out to be more interesting. It’s full of that sweet Muscle Shoals sound. “Willie and Laura Mae Jones,” “Say Man,” “I’m Just A Prisoner (Of Your Good Lovin’),” “Let It Be,” “I Can’t Leave Your Love Alone” and “Your Love Lifted Me,” Clarence Carter, from “Patches,” 1970. This is Side 1. It runs 18:30. 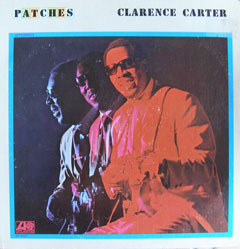 “Patches” is available digitally and on this 2-on-1 CD with “The Dynamic Clarence Carter,” which was released in 1969. They were Carter’s third and fourth albums. Side 1 starts with a nice cover of “Willie and Laura Mae Jones,” a Tony Joe White tune that had been covered a year earlier by Dusty Springfield on her legendary “Dusty in Memphis” LP. Three of the next four cuts were co-written by the great soul songwriter George Jackson. The third cut, “I’m Just A Prisoner (Of Your Good Lovin’)” was written by Jackson and sax legend Eddie Harris. It was a single for soul singer Candi Staton, who was married to Carter at the time. Love the Muscle Shoals horns on this one! The Beatles’ “Let It Be” gets taken to church with Carter’s slow, gospel-inspired take. This one, along with the Tony Joe White cover, showcase Carter the singer as storyteller. The last cut, “Your Love Lifted Me” was written by O.V. McClinton during his soul and R&B period. This isn’t Jackie Wilson’s “(Your Love Keeps Lifting Me) Higher and Higher,” which had come out three years earlier, but it could be a fine companion piece.